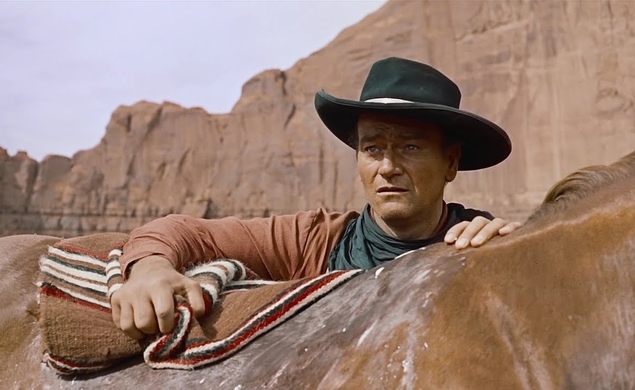 In the 2013 book The Searchers: The Making Of An American Legend, Pulitzer-winning author and journalist Glenn Frankel calls the John Wayne movie “perhaps the greatest Hollywood film that few people have seen.” Assuming that’s true, here’s the latest chance to rectify the problem: TCM is commemorating the July 4th weekend and its celebration of America in classic-Hollywood style by airing a series of Westerns from a variety of eras, and John Ford’s The Searchers is the best among them. It’s an endlessly surprising film, in large part because it starts out feeling like such a standard Hollywood Western, as Wayne’s tough, stoic character loses part of his family to a Comanche raid and sets out to reclaim the captured survivors. But then the film diverges from the expected action-rescue-revenge plot, and becomes bigger, wider, and sadder. (Especially bigger: Ford’s VistaVision look at the enormous empty spaces of Utah, Arizona, and Colorado is breathtaking.) The Searchers is more a look at American genocide and racism, and the poison of revenge-obsession, than it is an adventure movie, and it feels like one of the wisest and most mature Westerns on the classics docket. Frankel puts it this way: “We think we know what it is about, but its restless ambiguity defeats us. We honor its ambition and its artistry. But we have no firm sense of what it means nor how truly great and disturbing it is.” If you want to prove him wrong, check out The Searchers for yourself. It airs at 12:30 a.m. ET on TCM.